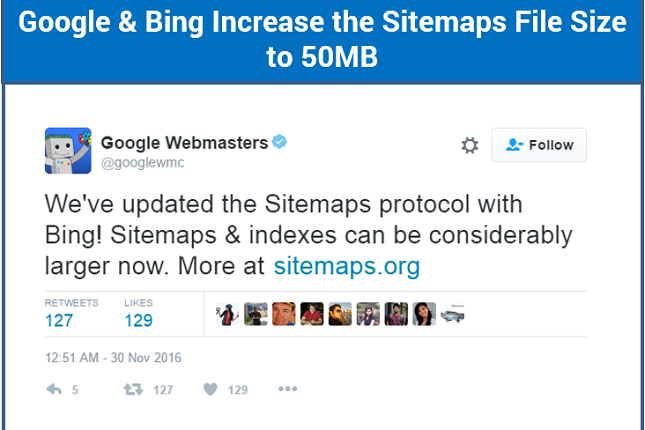 Google and Bing sitemap file size limit has been increased to 50 MB, earlier it was 10 MB only. 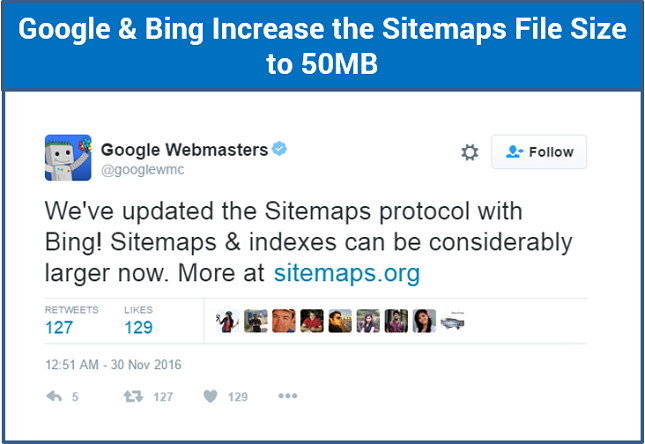 Google and Bing have taken efforts to increase the file size limit of Sitemaps files. Now, one can upload the uncompressed version of Sitemaps up to 50 MB. Earlier this limit was restricted to 10 MB only. Both the search engines have realized the difficulty faced by the websites with long URLs and thus they have increased the file size limit of sitemaps files by 400%. What is a Sitemap on a Website? Sitemap is a file containing a list of website URLs for Crawlers or search engine bots (a.k.a robots or spiders). A Sitemap is important because it simplifies the entire process for the webmasters. It allows webmasters to get information about each URL and to inform the search engines (Google, Bing, etc.) about different pages. In this way, search engines get to know about the pages that are available for crawling. In Sitemaps, URLs of a site are uploaded along with the additional metadata. The metadata will include its last update date, details of its change, its importance with respect to other URLs of the site. This will help the search engines to crawl the sites better. The latest Sitemap protocol, Sitemap 0.90 is under the terms of the Attribution- ShareAlike Creative Commons License. This is widely accepted and supported by Google, Bing, Yahoo and Microsoft. Sitemap is one of the vital ways of communication with the search engines. With the help of the robots.txt file, search engines get the command of which pages to be indexed and which to be excluded. So, it is an important SEO tool that has a direct impact on optimizing the site for search engines. Search engines often face the challenge to incorporate the long URLs or the additional URLs of the websites. This eventually, increases the sitemap file size by exceeding 10 MB. It is a good news for those websites that used to face these kinds of problems. There is also a limitation in the number of URLs that can be uploaded in one Sitemap, that is restricted to 50,000 URL. However, both the search engines have clarified the fact that there will be no changes in this figure. Only the file size has increased significantly, not the number of URLs. Search engines have only increased the MB number, not the number of URLs. So, it would be beneficial for those websites that have long URLs. Then, what about the large websites that have more number of pages, like eCommerce websites?